Abstract: This study aimed to optimize and evaluate a thermoresponsive ophthalmic in situ gel containing curcumin-loaded albumin nanoparticles (Cur-BSA-NPs-Gel). Albumin nanoparticles were prepared via a desolvation method, and the gels were prepared via a cold method. The central composite design and response surface method was used to evaluate the effects of varying Pluronic® F127 and Pluronic® F68 concentrations on the sol–gel transition temperature, which is an indicator of optimum formulations. The optimized formulation was a free-flowing liquid below 30.9°C that transformed into a semi-solid gel above 34.2°C after dilution with simulated tear fluid. Results of the in vitro release and erosion behavior study indicated that Cur-BSA-NPs-Gel achieved superior sustained-release effects and that incorporation of albumin nanoparticles exerted minimal effects on the gel structure. 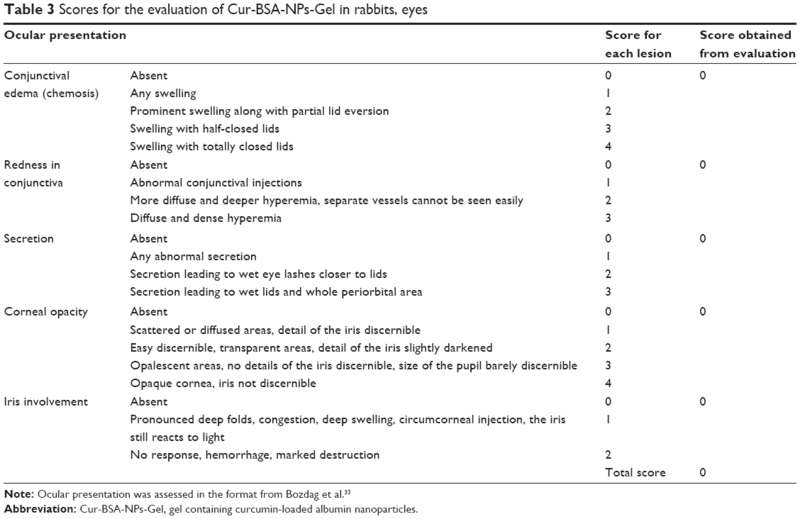 In addition, in vivo ophthalmic experiments employing Cur-BSA-NPs-Gel were subsequently performed in rabbits. In vivo eye irritation results showed that Cur-BSA-NPs-Gel might be considered safe for ophthalmic drug delivery. The in vivo study also revealed that the formulation could significantly increase curcumin bioavailability in the aqueous humor. In conclusion, the optimized in situ gel formulation developed in this work has significant potential for ocular application. Diabetes mellitus is a widely distributed chronic metabolic disorder characterized by impaired glucose metabolism caused by insulin deficiency or insulin resistance; the disease often leads to hyperglycemia and late development of vascular and neurological complications.1 One of the primary complications experienced by diabetic patients is diabetic retinopathy (DR), a severe complication of diabetes mellitus and the leading cause of blindness among middle-aged adults.2 DR is a complex progressive disease of the retina with multifactorial etiology. The pathogenesis of DR is fairly complex and involves different cells, molecules, and factors.3 All of the major retinal cells, including endothelial, ganglion, Müller, and pigment epithelial cells, may be damaged by diabetes.4 Diabetes induces maladjusted levels of metabolites, such as glucose, amino acids, and lipids, which activate retinal cells prior to damage.5,6 Laser photocoagulation remains the cornerstone of treatment for DR patients; however, a specific subgroup of DR patients do not respond effectively to this treatment.7 This therapeutic restriction has promoted interest in developing alternative treatments to address DR. Several therapeutic modalities, including intravitreal injection, ocular local administration, and surgical ablation, are currently under investigation.8,9 Our study focuses on DR management with local ocular administration of drugs. Curcumin, a traditional medicinal ingredient with poor solubility and stability, is used to provide frontline pharmacotherapy for a number of important diseases.10,11 Modern studies show that curcumin possesses a broad range of medicative properties, including anti-inflammatory, anticancer, antioxidant, and chemopreventive activities.12 Elaborate studies of different molecular pathways modulated by curcumin have proven that the drug is a potential therapeutic and nutraceutical constituent that could be used for the prevention and treatment of a great number of diseases.12,13 Curcumin is proved to be effective for ophthalmic use in various ocular fundus pathologies. It inhibits proliferation of human lens epithelial cells and protects retinal cells, retinal ganglion cells, and corneal epithelial cells.14–16 As diabetes damages mainly the major retinal cells, including endothelial, Müller, ganglion, and pigment epithelial cells, curcumin is used as the model medicine in this study for DR treatment. Albumin, an omnipotent protein carrier for drug delivery, has been proven to be non-immunogenic, nontoxic, biodegradable, and biocompatible.17 Amino acids in the albumin molecule are linked to each other by peptide bonds, and the molecules are twisted into a reticular structure. This structure is highly conducive for carrying and encapsulating drug molecules and enables delayed drug release. This specific structure has remarkable advantages in increasing the water solubility and stability of the loaded drug.18 As such, albumin is a suitable matrix material for fabricating nanoparticles (NPs) for drug delivery, particularly for drugs with poor water solubility, low bioavailability, and poor stability.19 Albumin NPs (BSA-NPs) have gained considerable research attention because of their excellent capacity for combining multifarious drugs and their property of being well tolerated without serious side-effects.20 Thus, we selected BSA-NPs as curcumin carriers for drug delivery to the eyes. A liquid formulation based on in situ gels consisting of polymer solutions that may be administered as a liquid was recently developed. The formulation undergoes sol–gel phase transition into a semisolid gel upon exposure to certain physiological conditions, such as a change in temperature or pH or contact with a specific ion.21,22 Gels that undergo sol–gel phase transition caused by a temperature change are called thermoresponsive in situ gels.23 Such gels have been extensively investigated as temperature-responsive materials for invertible thermoresponsive gelation under certain temperatures and concentrations.24 Two of the most frequently used gel matrices are Pluronic® F127 and Pluronic® F68 (BASF SE, Ludwigshafen, Germany); these gels differ only in their ratio of polyethylene oxide (PEO) and polypropylene oxide (PPO).25,26 To obtain a thermoresponsive gel with an appropriate sol–gel transition temperature for an ophthalmic drug delivery system, Ma et al27 incorporated Pluronic F68 into Pluronic F127 solutions to modulate the phase transition temperature. An optimum ophthalmic thermoresponsive in situ gel system must have a sol–gel transition temperature >25.0°C and convert to a semisolid gel form at precorneal temperature (34.5°C) after dilution with tear fluid. Such a property ensures that the ophthalmic thermoresponsive in situ gel can be delivered easily to the eye in drop form to prevent rapid precorneal drug loss, which is a major problem in conventional ophthalmic therapeutics. However, while hydrogels are generally suitable for water-soluble drugs, they are unsuitable for insoluble drugs, because insoluble drugs disperse in aqueous solution as suspensions, which results in poor bioavailability. Hence, in this work, BSA-NPs and in situ gels were combined to prolong the drug residence time and improve the ocular bioavailability of the drug. The present study aims to develop a thermoresponsive in situ gel system containing curcumin-loaded BSA-NPs (Cur-BSA-NPs) with the desired sol–gel phase transition temperature for local ocular administration to treat DR. The central composite design and response surface methods were used to evaluate the effects of varying Pluronic F127 and Pluronic F68 concentrations on the sol–gel transition temperature and select the optimum formulation. The formulation was then evaluated in terms of sol–gel transition temperature, viscosity, in vitro release, and erosion. In vivo eye irritation and ocular availability were evaluated in rabbits. In this study, BSA-NPs and in situ gels were initially combined and applied for ophthalmic use. This combination is an innovation in ocular drug delivery systems and shows significant potential in the clinical treatment of DR.
Curcumin was obtained from Shanghai Aladdin Industrial Corporation (Shanghai, People’s Republic of China). Pluronic F127 and Pluronic F68 were generously provided by BASF SE. Bovine serum albumin was purchased from Beijing Solarbio Science & Technology Co., Ltd (Beijing, People’s Republic of China). Male and female New Zealand White rabbits weighing 2.0–2.5 kg were provided by the Laboratory Animal Center, Chongqing Medical University (People’s Republic of China). BSA-NPs were prepared using a desolvation method, followed by crosslinking with glutaraldehyde.19 Briefly, 10 mg of albumin was dissolved in 1.0 mL of water. This aqueous phase was then desolvated with ethanol (6.0 mL). The coacervates formed were hardened for 4 hours using glutaraldehyde (0.50%, 50 μL). Organic solvents were removed using a rotary evaporator at 35.0°C. The resulting NPs were resuspended in distilled water and diluted to a metered volume of 5.0 mL. Cur-BSA-NPs were obtained as described above, except that 4.0 mg of curcumin was dissolved in 6.0 mL of ethanol in advance. Ethanol was added dropwise to the aqueous phase at a steady rate of 1 mL per minute. The drug-loading efficiency and encapsulation efficiency of the formulation were evaluated by ultraviolet (UV) spectrophotometry (UV-2000; Unico, Shanghai, People’s Republic of China). The particle size of each preparation was determined thrice using a Zetasizer (Malvern Instruments, Malvern, UK).The morphology of the Cur-BSA-NPs was observed by transmission electron microscopy (H-7500; Hitachi Ltd, Tokyo, Japan). A drop of the resultant Cur-BSA-NPs suspension was placed onto a carbon-coated 200 mesh copper grid, and the excess staining solution was removed using filter paper. The grid was then thoroughly air-dried for 2 hours prior to examination under the electron microscope. Thermoresponsive in situ gels were prepared on a weight basis using the cold method.28 Briefly, proportional amounts of Pluronic F127 and Pluronic F68 were added separately into the BSA-NP suspensions, stirred periodically, and refrigerated at 4°C until homogeneous solutions were obtained. A modified test tube inversion method was employed to roughly determine the sol–gel transition temperature of the in situ gels.23 A water bath was used to control the temperature, and the samples were heated at a rate of 0.5°C/min from room temperature. The test tube was inverted every minute, and the flow behavior of the gel was observed. The temperature at which the liquid in the tube remained steady for at least 30 seconds was recorded as the sol–gel transition temperature. Averages and standard deviations of each sample were determined in triplicate. The viscosity of the prepared formulations (10 mL of the sample) was determined using an NDJ-1 viscometer (Shanghai Tianping Instrument Technology Co., Ltd, Shanghai, People’s Republic of China). A water bath was employed to heat the samples. The viscosity of each formulation was measured at room temperature and after warming up. In situ gel containing curcumin (Cur-Gel) was prepared as a comparison to investigate the effect of BSA-NPs on the gelation temperature. All measurements were performed in triplicate. The erosion behavior study was conducted in a shaking water bath. Briefly, 2.0 g of each gel formulation was added into a pre-weighed vial. The samples were equilibrated at 34.5°C for 10 minutes to convert into semisolid gels prior to each measurement. STF (2 mL) preheated to 34.5°C was added into each vial as the release medium. The vials were weighed each time after STF removal. The disparities in weight of the vials between any two contiguous time points yielded the amount of dissolved gel formulation. The erosion profile was then obtained by plotting the cumulative weight of each formulation dissolved (ordinate) versus time (abscissa).21,27 The experiments were performed in triplicate to obtain the averages and standard deviations of each sample. Curcumin content in the aqueous humor was assayed by high-performance liquid chromatography (HPLC) (Agilent 1100; Agilent Technologies, Santa Clara, CA, USA). The instrument had a 20 μL injection volume and was coupled to a UV detector for detection at 422 nm. A Hypersil™ BDS C18 column (15 cm × 4.5 mm; Elite Analytical Instrument Co., Ltd, Dalian, People’s Republic of China) with a particle size of 5 μm was used. The mobile phase consisted of 730 mL of methanol and 270 mL of ultra-pure water containing 1.0% citric acid and was pumped at a flow rate of 1.0 mL/min. The samples were prepared by mixing 20 μL of HCl (0.1 mmol/L) and 2 mL of ethyl acetate into the aqueous humor for 4 minutes. This mixture was centrifuged for 10 minutes at 12,000 rpm. The supernatant was transferred into a fresh tube and then dried under reduced pressure. The residue was dissolved in 50 μL of the mobile phase by swirl mixing for 1 minute, and then centrifuged once more. The supernatant was then analyzed for curcumin content using HPLC.34 Different concentrations of curcumin in the aqueous humor (7.8125, 250, and 4,000 ng/mL) were determined for bioanalytical method validation. DAS2.0, issued by the China Food and Drug Administration for pharmacokinetic study, was applied to calculate relevant pharmacokinetic parameters. A light yellow, translucent suspension of Cur-BSA-NPs was obtained. The size distribution of the Cur-BSA-NPs (Figure 1A) showed a mean size of 221.2 nm. The morphology of the Cur-BSA-NPs (Figure 1B) exhibited a normal spherical shape with no aggregation or degradation. The drug-loading efficiency and encapsulation efficiency of the formulation were 4.07%±0.08% and 85.48%±1.03% respectively, indicating excellent drug-loading efficiency. All of the in situ gels prepared by the cold method were transparent and showed good fluidity at room temperature. Thus, the developed formulation may conveniently be stored without a refrigerator, which could promote patient compliance. 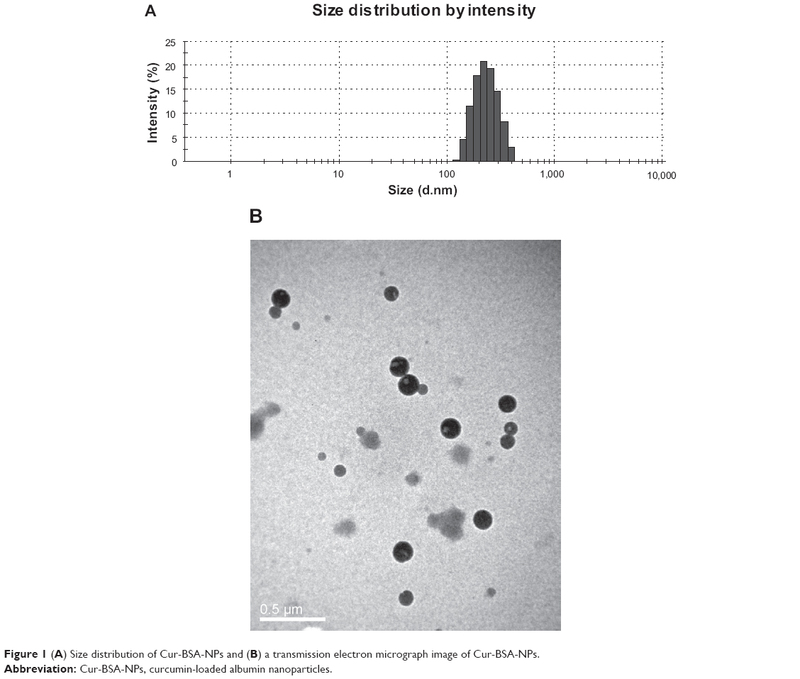 Figure 1 (A) Size distribution of Cur-BSA-NPs and (B) a transmission electron micrograph image of Cur-BSA-NPs. Abbreviation: Cur-BSA-NPs, curcumin-loaded albumin nanoparticles. Figure 2A and B clearly shows the linear effects of Pluronic F127 concentration (X1) and Pluronic F68 concentration (X2) on the sol–gel transition temperatures before (R1) and after (R2) dilution. All of the results indicate that the sol–gel transition temperature decreased with increasing X1 and decreasing X2. We selected the optimal formulation at an average ocular surface temperature of about 34.5°C; this formulation consisted of 26% (w/w) Pluronic F127 and 4% (w/w) Pluronic F68 as the gel matrix. The optimized formulation was a free-flowing liquid at <30.9°C and converted to a semisolid gel at >34.2°C after dilution with STF. Figure 2 Response surface plot showing concentration effect of Pluronic® F127 (X1) and Pluronic® F68 (X2) on sol–gel transition temperature. Sol–gel transition temperatures of in situ gels before (A) and after (B) dilution both increased with the increased concentration of Pluronic F68 and decreased concentration of Pluronic F127. The variation in viscosity under different conditions is an important rheological parameter to consider in the utilization and in vivo performance of thermoresponsive in situ gels. Formulations with excessively high viscosity are difficult to administer.30 By contrast, drainage increases if the formulation viscosity is too low. As such, the optimum preparation should possess lower viscosities under storage conditions and higher viscosities in physiological environments. The viscosity values obtained by the viscometer are given in Table 2. At temperatures <31.0°C, both Cur-BSA-NPs-Gel and Cur-Gel showed low viscosities, which indicates that the formulations could be instilled into the eye easily without need for storage in a refrigerator. The viscosities of Cur-BSA-NPs-Gel and Cur-Gel slightly decreased after dilution with STF, but their viscosities at 34.5°C were apparently higher than those at 25°C. This phenomenon indicates that the formulations may potentially prolong the contact time of curcumin in the eye. Abbreviations: Cur-BSA-NPs-Gel, gel containing curcumin-loaded albumin nanoparticles; Cur-Gel, gel containing curcumin. A dialysis tube method and a membraneless approach were employed to study the in vitro release and erosion behavior, respectively, of Cur-BSA-NPs-Gel. Given the unique anatomical configuration and physiological characteristics of the eyes, ophthalmic gels are continuously diluted by tear fluid, and the drug must permeate through the cornea to produce an effect. The dialysis tube method allows interpretation of the release behavior of a drug for ophthalmic drug delivery but it cannot adequately study gel erosion behaviors. The membraneless approach is more appropriate for gel erosion behavior studies. Previous investigations have suggested that NPs exhibit burst release. After combination with in situ gels, the NP-loaded thermosensitive gels exhibited reduced burst release, which results from a change in diffusion mechanism. The NPs are initially released from the gel matrix followed by curcumin, resulting in postponed release behavior. Figure 3A shows a typical plot of the cumulative drug release of the in situ gel formulations versus time. The release study indicated that incorporation of BSA-NPs significantly enhanced the dissolution rate and cumulative release percentage of curcumin compared with the gel alone. Compared with the Cur-BSA-NPs, the combination of BSA-NPs and gel prolonged the release time, which would result in prolonged effects after application in the eyes. Figure 3 Release curve (A) and erosion curve (B) of different formulations. Note: Most error bars are smaller than the symbols. Abbreviations: Cur-BSA-NPs, curcumin-loaded albumin nanoparticles; Cur-BSA-NPs-Gel, gel containing curcumin-loaded albumin nanoparticles; Cur-Gel, gel containing curcumin. Figure 3B shows the gel erosion behavior obtained using the membraneless method. The behaviors of Cur-BSA-NPs-Gel and Cur-Gel were similar, which demonstrates that incorporation of BSA-NPs into the gel has no effect on the gel structure. Moreover, the gel erosion profiles of both formulations were linear until approximately 95% of the gel had dissolved. Changes in the cornea, iris, conjunctiva, secretion, and chemosis were carefully observed and recorded after the formulations were applied into the conjunctival sac of the rabbit’s eye. As shown in Table 3, no lesion formation was observed during the test. Cur-BSA-NPs-Gel did not irritate the rabbit eyes, as indicated by the total score of 0 obtained from eye irritation evaluations. Hence, Cur-BSA-NPs-Gel may be considered safe for ophthalmic drug delivery. Abbreviation: Cur-BSA-NPs-Gel, gel containing curcumin-loaded albumin nanoparticles. The curcumin concentrations in the aqueous humor of New Zealand White rabbits obtained at various time points after instillation of 50 μL of Cur-BSA-NPs-Gel and Cur-sus are shown in Figure 4. 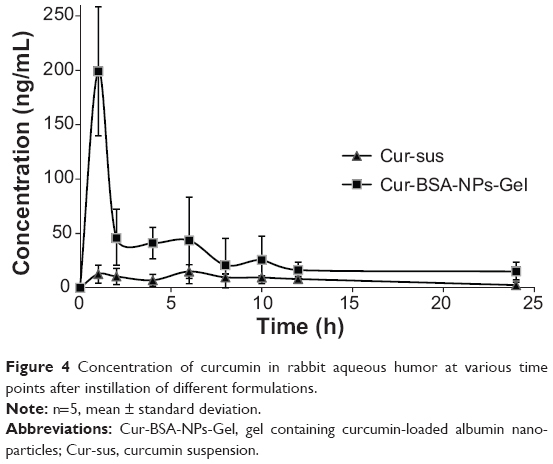 Curcumin contents in the aqueous humor of rabbits administered Cur-BSA-NPs-Gel were significantly higher at all time points than those obtained after instillation of the Cur-sus. The pharmacokinetic parameters of curcumin in the aqueous humor after instillation of the two formulations are shown in Table 4. The maximum curcumin concentration in the aqueous humor observed after Cur-BSA-NPs-Gel administration was 5.6-fold higher than that obtained after administration of the Cur-sus. Calculation of the area under the curve of different formulations indicated that ocular bioavailability in the aqueous humor increased 4.4-fold after application of Cur-BSA-NPs-Gel compared with that observed after administration of the Cur-sus. This result indicated that Cur-BSA-NPs-Gel significantly enhanced the ocular bioavailability of curcumin (P<0.01). Figure 4 Concentration of curcumin in rabbit aqueous humor at various time points after instillation of different formulations. Note: n=5, mean ± standard deviation. Abbreviations: Cur-BSA-NPs-Gel, gel containing curcumin-loaded albumin nanoparticles; Cur-sus, curcumin suspension. Abbreviations: AUC, area under the curve; Cmax, maximum curcumin concentration; Tmax, time to maximum concentration. Bioanalytical method validation parameters were statistically analyzed. The mean extract coefficient of recovery was 94.74%±6.16%, the mean method coefficient of recovery was 89.22%±5.41%, and the mean relative standard deviations of within-day and day-to-day precision were 3.78% and 3.94%, respectively. The results thus far indicate that Cur-BSA-NPs-Gel could significantly increase the curcumin content absorbed by the eyes, resulting in better ophthalmic bioavailability of curcumin compared with the use of curcumin suspension. Rabbit eyes punctured by a syringe needle and treated with Cur-BSA-NPs-Gel showed better recovery and less swelling, corneal opacity, and redness compared with eyes treated with Cur-sus. This finding indicates that the proposed formulation may be used to treat other eye diseases. In this study, a thermoresponsive in situ gel system based on Pluronic F127 and Pluronic F68 and containing Cur-BSA-NPs was developed for ophthalmic drug delivery. The physicochemical properties of Cur-BSA-NPs-Gel showed temperature-responsive features. Thus, this formulation, which transforms into a gel when exposed to eye temperature, may be applied as eye drops. The sol–gel transition temperature depended on the Pluronic F127 and Pluronic F68 concentrations; increases in Pluronic F127 content decreased the sol–gel transition temperature of the formulation, whereas increases in Pluronic F68 increased the sol–gel transition temperature. The optimized Cur-BSA-NPs-Gel formulation obtained from this study was composed of 26% (w/w) Pluronic F127 and 4% (w/w) Pluronic F68 as the gelling matrix. In vitro release and erosion behavior studies showed that incorporation of BSA-NPs significantly enhanced the dissolution rate of curcumin without affecting the gel properties. In vivo eye irritation tests of Cur-BSA-NPs-Gel demonstrated that the formulation may be considered safe for ophthalmic use. Cur-BSA-NPs-Gel could also enhance the ophthalmic bioavailability of curcumin in rabbit eyes and remarkably reduce the administration frequency compared with other suspension formulations. Thus, the Cur-BSA-NPs-Gel system proposed in this work shows potential for use as an ophthalmic delivery system with prolonged drug residence time and improved ocular bioavailability. This project was supported by Natural Science Foundation Project of CQ CSTC (No. cstc2012jjA10021), the National Research Foundation for the Doctoral Program of Higher Education of China (No. 20125503120003), Scientific and Technological Research Program of Chongqing Municipal Education Commission (Grant No. KJ110323 and KJ120307), Chongqing Board of Health Project (2013-2-060), Chongqing Yuzhong District Science and Technology Project (No. 20100203), Students’ Research and Innovation Experimental Project of Chongqing Medical University (201244, 201229, 201217), and Students’ Scientific Research Fund of “star of HIFU” (XS201309). Alghadyan AA. Diabetic retinopathy – an update. Saudi J Ophthalmol. 2011;25(2):99–111. Sivaprasad S, Gupta B, Crosby-Nwaobi R, Evans J. Prevalence of diabetic retinopathy in various ethnic groups: a worldwide perspective. Surv Ophthalmol. 2012;57(4):347–370. Ola MS, Nawaz MI, Siddiquei MM, Al-Amro S, Abu El-Asrar AM. Recent advances in understanding the biochemical and molecular mechanism of diabetic retinopathy. J Diabetes Complications. 2012;26(1):56–64. Agrawal SS, Naqvi S, Gupta SK, Srivastava S. Prevention and management of diabetic retinopathy in STZ diabetic rats by Tinospora cordifolia and its molecular mechanisms. Food Chem Toxicol. 2012;50(9):3126–3132. Bartlett HE, Eperjesi F. Nutritional supplementation for type 2 diabetes: a systematic review. Ophthalmic Physiol Opt. 2008;28(6):503–523. Grant MB, Davis MI, Caballero S, Feoktistov I, Biaggioni I, Belardinelli L. Proliferation, migration, and ERK activation in human retinal endothelial cells through A(2B) adenosine receptor stimulation. Invest Ophthalmol Vis Sci. 2001;42(9):2068–2073. Pai A, El Shafei MM, Mohammed OAZ, Al Hashimi M. Current concepts in intravitreal drug therapy for diabetic retinopathy. Saudi J Ophthalmol. 2010;24(4):143–149. Maia OO Jr, Takahashi BS, Costa RA, Scott IU, Takahashi WY. Combined laser and intravitreal triamcinolone for proliferative diabetic retinopathy and macular edema: one-year results of a randomized clinical trial. Am J Ophthalmol. 2009;147(2):291–297. e2. Choi KS, Chung JK, Lim SH. Laser photocoagulation combined with intravitreal triamcinolone acetonide injection in proliferative diabetic retinopathy with macular edema. Korean J Ophthalmol. 2007;21(1):11–17. Mosieniak G, Adamowicz M, Alster O, et al. Curcumin induces permanent growth arrest of human colon cancer cells: link between senescence and autophagy. Mech Ageing Dev. 2012;133(6):444–455. Oh SW, Cha JY, Jung JE, et al. Curcumin attenuates allergic airway inflammation and hyper-responsiveness in mice through NF-kappaB inhibition. J Ethnopharmacol. 2011;136(3):414–421. Molina-Jijon E, Tapia E, Zazueta C, et al. Curcumin prevents Cr(VI)-induced renal oxidant damage by a mitochondrial pathway. Free Radic Biol Med. 2011;51(8):1543–1557. Wahl H, Tan L, Griffith K, Choi M, Liu JR. Curcumin enhances Apo2L/TRAIL-induced apoptosis in chemoresistant ovarian cancer cells. Gynecol Oncol. 2007;105(1):104–112. Hu YH, Huang XR, Qi MX, Hou BY. Curcumin inhibits proliferation of human lens epithelial cells: a proteomic analysis. J Zhejiang Univ Sci B. 2012;13(5):402–407. Burugula B, Ganesh BS, Chintala SK. Curcumin attenuates staurosporine-mediated death of retinal ganglion cells. Invest Ophth Vis Sci. 2011;52(7):4263–4273. Ritch R. Natural compounds: evidence for a protective role in eye disease. Can J Ophthalmol. 2007;42(3):425–438. Zhao D, Zhao X, Zu Y, et al. Preparation, characterization, and in vitro targeted delivery of folate-decorated paclitaxel-loaded bovine serum albumin nanoparticles. Int J Nanomedicine. 2010;5:669–677. Zhang L, Hou S, Mao S, Wei D, Song X, Lu Y. Uptake of folate-conjugated albumin nanoparticles to the SKOV3 cells. Int J Pharm. 2004;287(1–2):155–162. Zu Y, Zhang Y, Zhao X, Zhang Q, Liu Y, Jiang R. Optimization of the preparation process of vinblastine sulfate (VBLS)-loaded folate-conjugated bovine serum albumin (BSA) nanoparticles for tumor-targeted drug delivery using response surface methodology (RSM). Int J Nanomedicine. 2009;4:321–333. Nanjawade BK, Manvi FV, Manjappa AS. In situ-forming hydrogels for sustained ophthalmic drug delivery. J Control Release. 2007;122(2):119–134. Hsiue GH, Chang RW, Wang CH, Lee SH. Development of in situ thermosensitive drug vehicles for glaucoma therapy. Biomaterials. 2003;24(13):2423–2430. Asasutjarit R, Thanasanchokpibull S, Fuongfuchat A, Veeranondha S. Optimization and evaluation of thermoresponsive diclofenac sodium ophthalmic in situ gels. Int J Pharm. 2011;411(1–2):128–35. Jeong B, Kim SW, Bae YH. Thermosensitive sol–gel reversible hydrogels. Adv Drug Deliv Rev. 2002;54(1):37–51. Nie S, Hsiao WL, Pan W, Yang Z. Thermoreversible Pluronic F127-based hydrogel containing liposomes for the controlled delivery of paclitaxel: in vitro drug release, cell cytotoxicity, and uptake studies. Int J Nanomedicine. 2011;6:151–166. Kim EY, Gao ZG, Park JS, Li H, Han K. rhEGF/HP-beta-CD complex in poloxamer gel for ophthalmic delivery. Int J Pharm. 2002;233(1–2):159–167. Ma WD, Xu H, Wang C, Nie SF, Pan WS. Pluronic F127-g-poly(acrylic acid) copolymers as in situ gelling vehicle for ophthalmic drug delivery system. Int J Pharm. 2008;350(1–2):247–256. El-Kamel AH. In vitro and in vivo evaluation of Pluronic F127-based ocular delivery system for timolol maleate. Int J Pharm. 2002;241(1):47–55. Chopra S, Motwani SK, Iqbal Z, Talegaonkar S, Ahmad FJ, Khar RK. Optimisation of polyherbal gels for vaginal drug delivery by Box-Behnken statistical design. Eur J Pharm Biopharm. 2007;67(1):120–131. Wei G, Xu H, Ding PT, Li SM, Zheng JM. Thermosetting gels with modulated gelation temperature for ophthalmic use: the rheological and gamma scintigraphic studies. J Control Release. 2002;83(1):65–74. Abashzadeh S, Dinarvand R, Sharifzadeh M, Hassanzadeh G, Amini M, Atyabi F. Formulation and evaluation of an in situ gel forming system for controlled delivery of triptorelin acetate. Eur J Pharm Sci. 2011;44(4):514–521. Giovagnoli S, Tsai T, DeLuca PP. Formulation and release behavior of doxycycline–alginate hydrogel microparticles embedded into Pluronic F127 thermogels as a potential new vehicle for doxycycline intradermal sustained delivery. AAPS Pharm Sci Tech. 2010;11(1):212–220. Bozdag S, Gumus K, Gumus O, Unlu N. Formulation and in vitro evaluation of cysteamine hydrochloride viscous solutions for the treatment of corneal cystinosis. Eur J Pharm Biopharm. 2008;70(1):260–269. Song Z, Feng R, Sun M, et al. Curcumin-loaded PLGA-PEG-PLGA triblock copolymeric micelles: preparation, pharmacokinetics and distribution in vivo. J Colloid Interface Sci. 2011;354(1):116–123. Klouda L, Mikos AG. Thermoresponsive hydrogels in biomedical applications. Eur J Pharm Biopharm. 2008;68(1):34–45.